Today is Good Friday of Easter weekend and tonight at sunset is also the beginning of the Jewish Passover festival. My very best wishes to all who observe these sacred and meaningful holidays. Today’s lovely tangle pattern is named Loop and it’s from CZT Amelie Liao of Taiwan and she’s provided some beautiful examples using her tangle. (Any resemblance to symbols of Christianity are entirely on purpose on my part for today.) Amelie recently shared her Oolo tangle with us. I have to confess this tangle was a real challenge for me but I persisted through many (I repeat, many) examples before coming up with one I was comfortable sharing. And the way I eventually came up with it varies from the way Amelie demonstrates in her steps below and the clues for my way to draw it are revealed in the example at right. That’s right, I drew the strokes “attached” to the loops and then went back in and drew the ones in the center. Different route, same destination. 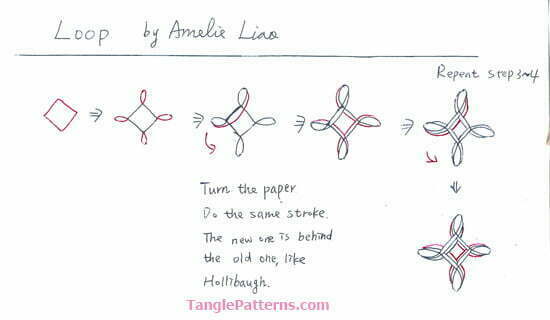 Amelie’s tangle is based on the Hollibaugh technique of “drawing behind” and Amelie writes that Loop was inspired in part by the Zentangle®-original tangle Auraknot. Amelie illustrates the step-by-step instructions for drawing Loop below. Remember when you get to Steps 3 and 4 that you draw the additional strokes “behind” the previous ones. Here is Amelie’s lovely Zendala featuring Loop. Check out the tag ameliel for more of Amelie’s tangles on TanglePatterns.com. Once again, Happy Easter and Happy Passover! Amelia’s Loop is just beautiful! Had to practice several times, but finally have it! Thank you. Absolutely beautiful! I am anxious to give this a try. Thank you for sharing. Wow – REALLY like this one. Thanks for sharing. Beautiful tangle! It actually reminds me of a Scandinavian woven wood decoration my mother has (of which I do not currently have a photo). And Linda, I always appreciate the holiday/historic notes you occasionally include with these posts. It often satisfies my “learn something new every day” goal. 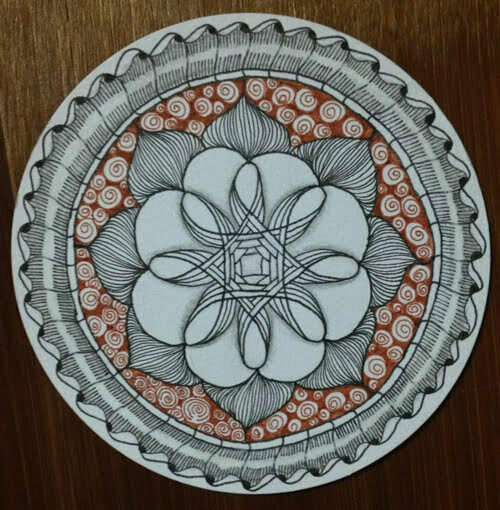 This one reminds me of the spirograph things we used to draw as kids. fun. Is there a way to bring the steps up larger? It looks like an interesting pattern. Thank you. Computer Tip: If you hold down the Ctrl key and roll your mouse scroll button, you can increase/decrease the size of the webpage (and documents) on your screen. Use Ctrl 0 (the number 0) to return to normal view size. You don’t even need a mouse to zoom in/out. You can also use the keyboard. Use Ctrl and the + (plus) or – (minus)keys to zoom image size. Ctrl 0 (zero)returns to default size. Amelie, your tangle is GORGEOUS! I keep thinking “OK, all possible tangles have now been discovered” … and THEN … a beauty like this comes along! Thank you for sharing it with the world. I’m looking forward to drawing it in just a few minutes! Wow, love this new tangle, it’s beautiful! The zendala is amazing, also. Thank you, Amelie. Linda, I enjoy the religious information, also. This is a lovely tangle. 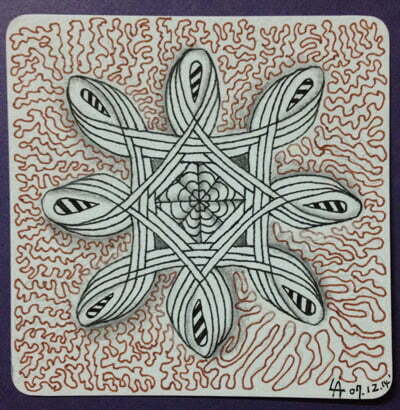 I’m particularly attracted to “woven” tangles and it was fun to do. I thought it would be tricky but found it to be very forgiving of my neophyte’s slightly asymmetrical starting shapes and uneven line spacing. Wow, the girl not only did a lovely example, but it was a DOUBLE Loop! And she did it twice! Awesome! When my brain stops hurting, I’ll have to try this one! I can hardly wait to try this! This tangle is so nice and so fluent, when you are in it. I love it. Very pretty and versatile tangle. Thanks for sharing!